When it comes to React vs Angular, just a quick glance at their website and you will know the most basic yet very crucial difference between React, a JS library and Angular, a front-end development framework. Angular: One framework. Mobile & Desktop. Your code calls the library. Your framework calls your code. A framework has defined open or unimplemented functions or objects which is used to create custom applications. A library offers set functions, objects, and modules which applications code calls for specific functionality. This basic conceptual difference in development takes React vs Angular comparison to the next level. Certainly, comparing a framework with library is not fair in itself. But a comparison is worthwhile and essential to understand how the differences between React and Angular impact the web or mobile app development process. 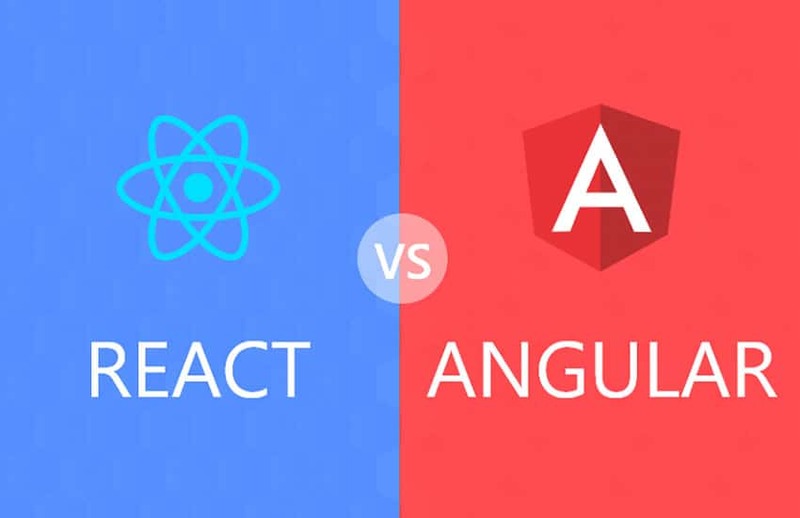 Here we have created this React vs Angular comparison guide which will help you to pick between React and Angular as well as an Angular native app development company or React app development company confidently. So, the big question is when a framework already has views, then why do we need React? It is because React does not replace views but augment them with reusable UI components such as tab bars, pop up modals, sortable modals, lists, and comment boxes. Now that we know the key strengths of Angular and React, let’s deep dive into information that classify the features and functions that give strength to Angular vs React debate. Both React and Angular are used by a large number of brands, based on their requirements. For a high-level analysis of React vs Angular, let’s explore some of the key benefits of the frontend development framework and JS library, which will help you determine what to select for your application development project. The core concepts and features of the library clearly explain its benefits. React has UI developer friendly components, which is used to build user-friendly web applications. As each component has its own logic and controls its own rendering, it can be reused whenever required. Reusability of code make app development easier and also help in implementing a consistent look and feel throughout the whole project. This feature is really helpful when your app has a lot of user interaction and data updates. Virtual DOM is considered one of the biggest leaps in web development since AJAX. It helps in creating faster and scalable applications. Powered by memory reconciliation algorithm, it creates a representation of the page in virtual memory and performs updates before rendering the final web-page. However, refrain from extensive DOM manipulation as it can lead to performance bottle-neck. It has a number of designing and debugging tools that help in creating a perfect development environment. React Developers Tools enable the developers to inspect the React component hierarchies and ability to select, analyze, and edit individual components and their properties and state. Angular offers you a number of tools to create web applications without getting entangled into classes and methods. Angular developers can structure their code, without spending too much time on creating design patterns. Google is the king of search engines, and it is already working on PWA, Progressive Web Application, which is the latest trend in the web application development market. Since Angular is maintained by Google, it offers a package known as @angular/ service-worker, which are small proxies in the browsers, and when activated, it allows to cache static assets. It saves time and improves performance, as you don’t have to fetch the asset every time during reloading. Along with the above, there are several other features such as TypeScript support by Angular 5, Build Optimizer and quick compilation, which make it a widely used framework by web application development companies. Usually, companies with a large team of developers use Angular framework because it provides key support and enhanced capabilities to build web applications. This comparison between React and Angular will help you decide to pick the right platform for your project. Now let’s take a look at companies that use React or Angular for their applications. When your project has many components in changing state, such as dynamic inputs, accordion sections expanded/collapsed, access permissions, and more. Complex applications where change occurs frequently. It helps to fight “spaghetti code, wherein code organization and structure do not match. Angular is an excellent choice for enterprise application development. It is extensively used by Angular development companies for creating web applications for large enterprises. Angular is the umbrella term, which is used for all the versions of Angular. In spite of this TypeScript-based open-source web application development framework being launched after AngularJS. Angular is commonly used with Ionic framework to build mobile applications. You need to check with your mobile application development company to know what framework they use with Angular to build mobile applications. No matter how much information you collect on this React Vs. Angular topic, picking the one is always difficult and extremely crucial. Maybe this is the reason why the Internet is flooded with Angular vs. React comparison. Whether you need to build a mobile application or web app, make sure you have the support of a reliable web and mobile application development company having experienced developers and good resources.